It seems a certainty that Apple would at least be thinking about adding support for the Apple Pencil to the iPhone, but exactly when it'll happen (if it ever does) isn't so clear. A new report puts the date at 2019, so perhaps just in time for the iPhone XII. The new report comes courtesy of The Investor in South Korea, which says its sources reckon an iPhone with a "digital pen" is going to appear in a couple of years time. Apparently this would use a slightly different technology to the current Pencil, so you wouldn't be able to use your iPad stylus on your iPhone. Steve Jobs was famously against the use of styluses with touchscreen devices, but times change, and iPhones have grown a lot bigger over the last ten years. Samsung of course has a premium handset with a stylus in its current range. 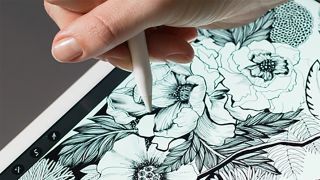 The Apple Pencil has been getting more and more useful over time, with new handwriting and drawing features added in the latest iOS 11 update. A similar code upgrade would be required to add stylus support on the iPhone, but that should present no problems. We saw a patent in April and another one in August that suggested the Apple Pencil could eventually be updated to support the iPhone as well, so it's obviously something that the execs in Cupertino are thinking about. We'll have to wait and see when it actually becomes a reality though. However, based on the new report, we won't be seeing stylus support in the 2018 range of iPhones - so you won't be able to pick up a Pencil-equipped handset in your shopping for at least 12 months yet.